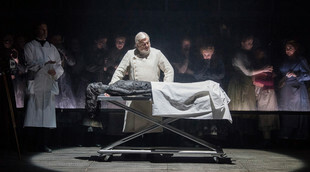 Jack the Ripper: The Women of Whitechapel is a new opera by composer Iain Bell and librettist Fiona Jenkins, and represents a co-commission between English National Opera and Opera North. Though the figure of the killer has enjoyed much attention as his identity, motive and mindset have been speculated on throughout the ages, the women he dispatched and mutilated have been more or less forgotten. This opera intends to redress the balance by considering the poverty they experienced that put them in the position of being such easy prey for him in the first place. In this way, it presents a dramatic reimagining based loosely on his five victims and accounts of the wider community of women living in Whitechapel at the time. The action is set in 1888 in an East London doss house, where the women sleep either on the floor or in coffins. What little protection it does provide tends to derive from the solidarity and support that the women show each other, even though they do fight among themselves at times. However, they still have to go out and work the streets at night, being constantly reminded by the senior Maud that every farthing has to be earned. The strength of the opera rests in the way in which it presents insights into the women’s lives, extrapolates several themes from these, and then reveals a number of facets to each. For example, the women’s lack of choice in life, and the way in which this leads to situations that perpetuate themselves, is emphasised. Maud explains that she was practically born into prostitution, and clearly her inability to know and hence visualise any other way of life has left her simply thinking how to survive within this one. As such, she propels the status quo by tolerating anything, including expediting abortions, and imposing her methods and beliefs on others. For example, she is perfectly willing to sell Mary Kelly’s daughter Magpie (Ashirah Foster Notice ‘alternating’ with Sophia Elton) as a ‘fresh parcel’ to the Commissioner of Police (Robert Hayward) when he offers the right price. Although the opera as a whole reveals how the men have the upper hand, and often show little regard, if not outright contempt, for the women, there are exceptions to this rule. In fact, two men in particular suffer terrible fates, demonstrating how when people are fearful or desperate they can turn on anyone. Squibby (Alex Otterburn) works in the knacker’s yard, and brings the women the leftover scraps in an example of someone with absolutely nothing showing what kindness they can. He wants Mary Kelly to come away with him, but she refuses, revealing the sad situation where prostitution is deemed a better alternative than going with a decent man who has absolutely nothing. At the inquest the crowd, feeling roused, end up turning on and killing Squibby, who in the opera does not even receive the same dignity as the female victims who have a scene to themselves at the end. The second is a character called The Writer (William Morgan) who wishes to expose the horrors the women face on a daily basis. He is admitted to the doss house to conduct research, but some view him with suspicion, and at the moment when he might actually make headway in breaking the awful cycle the women are trapped in, Maud moves against him to ensure that it continues and he suffers. In spite of all this, the opera’s conclusion does offer a glimmer of hope as one character is seen to ‘escape’. Daniel Kramer’s production recognises that the opera demands a slightly more intimate setting than, for example, Puccini’s do. In this way, Soutra Gilmour’s set introduces a frame around the stage that makes the performance space feel relatively small and repressive as it reveals a dark, box-like area. The body of the first victim, a character that we never see, is revealed as a completely blackened cadaver on an autopsy trolley. After this, however, the death of any woman is signified by crowds closing in on her as she walks the streets before cutting to The Pathologist (Alan Opie) describing the wounds over an empty trolley, thus bringing a small degree of sensitivity to the portrayal of such highly brutal acts. Bell’s music is suitably dark, brooding and foreboding, although variation is also introduced as one of the women, Liz, sings ‘six little trollops’ as if it were a dysfunctional nursery rhyme. Martyn Brabbins conducts superbly, while the cast includes such well-established names as Josephine Barstow (Maud), Susan Bullock (Elizabeth Stride), Lesley Garrett (Catherine Eddowes), Janis Kelly (Polly Nichols) and Marie McLaughlin (Annie Chapman). They all play their parts to the full, while Natalya Romaniw also stands out in what is essentially the lead role of Mary Kelly, with her final proclamation to the world proving especially moving.